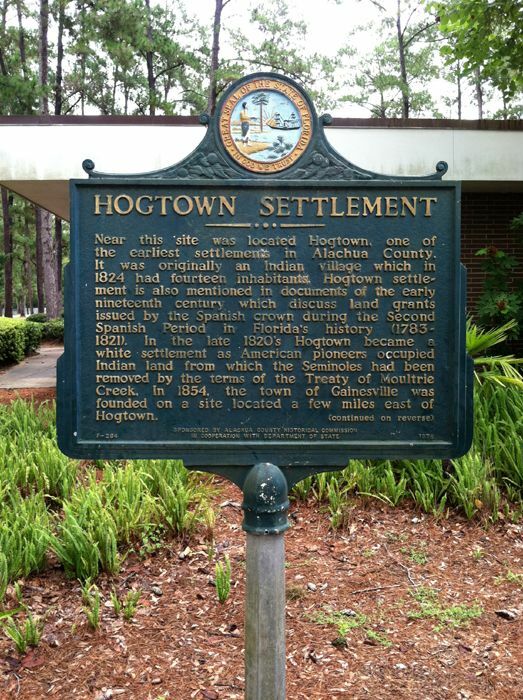 Hogtown one of the earliest settlements in Alachua County, this was originally a Seminole Indian village, in which the residents raised hogs. The settlement was dubbed “Hogtown” by nearby white people who traded with the Indians. In the late 1820’s Hogtown became a white settlement as American pioneers occupied Indian land from which the Seminole had been removed by the terms of the Treaty of Moultrie Creek. During the Second Seminole War (1835-42), a settler’s fort called Fort Hogtown was built at Hogtown and men from the area organized a volunteer company of mounted riflemen. For several months, members of the Guards periodically paraded and patrolled the countryside to protect the inhabitants against Indians. In 1854, the town of Gainesville was founded a few miles east of Hogtown. Today, Hogtown is a part of Gainesville, Florida. There are no remains of the fort but a historical marker designates the site of the settlement at NW 34th Street and 8th Avenue.